"It was kind of unreal in a way having won 16-0"
At the FACEIT London Major we got to have some time to talk to Astralis player dupreeh about the 16-0 win against MIBR, how the major/legend system could be improved and the Kjaerbye/Magisk situation. Grady: So we're here with Dupreeh from Astralis. First off, how's it going? dupreeh: Yeah, I'm kind of relaxed and looking forward to playing, so everything's fine. How have you found London? London's great. We've been here a lot of times and I've also been here as a tourist, so I know my way around. I'm enjoying it. It feels good to be back, because we also came from winning the last tournament here, so yeah we feel confident and we feel great being here. So your game is in, I believe, two days? How are you feeling going in to that? FaZe Clan is obviously a tough opponent, you can't deny that. They did look a little bit shaky in the Group Stage of the tournament. At the same time I feel like we showed some really good things in the tournament, and we also showed some really bad ones where we had some really hard struggles. But, overall I think we did well. I think we have a really good idea of how to approach FaZe Clan, and I'm just looking forward to playing them. I think it's going to be a good match. As a team do you ever think about the next game before this one is over, or is it always just this game? Obviously you do tend to start thinking about 'what if we win this quarterfinal and what if we win this semifinal?' but I feel like if you start doing that you are going to have too many thoughts in your head. I feel like when you get to this process and this part of the tournament it is really important to try to stay focused on one game at a time. Knowing the way you are going to approach FaZe Clan is going to be different and the way you are going to potentially face Liquid is different, so you have to have a different mindset and focus. So you guys at the last major fell out of the Legends and fought your way back in. How do you like the whole Legends system? I think some of it is good, some of it is really bad. What I think is the worst part is that you can have a team that is potentially playing great at the current tournament, and then six months later they might have changed three players or two players, well just two players to continue to have the core. But they might have changed two players, they might not have any results at all, they might not play as they used to do and they will still retain a legends spot. Which I feel like is a little bit odd. I think you could potentially do it the way, say you qualify for the Legends in the first tournament, and then you can't lose a certain amount of spots in the rankings. If you do so, you will drop out and actually not have that spot anymore. I don't know how you would invite other teams instead then, because that's kind of the hard thing. I think it's always hard to find a better solution. Everyone talks about it being flawed and it's not good, but then again people don't come up with a solution. I think it's very hard. But I think there is definitely some optimization to done. And with both of those previous stages being Swiss format with the final matches being best of 3, do you like the Swiss format? I think Swiss is kind of interesting. Now we try the Buchholz system as well, where they started reseeding after the third round. It gave some really interesting match-ups in the beginning but I think that was mainly because the top of the table started messing up, and they got each other fairly often. I think Swiss is a decent system, and I really like the fact that you have to win a best of 3 before you get knocked out. I think that's very important. At least you have to play best of 3 to qualify if you go 2-2. Obviously if you keep losing you will go out in best of ones, but I think the system has improved since last time. So do you like the minor system as it is, where, essentially anyone can qualify for the major? Yeah, I think there's always been this discussion whether we like the online qualification part and all that stuff. I think you can potentially go one step further down and say maybe you could have an online qualification, but then you have the closed qualifier offline. That way if you have a really good team coming that no one ever heard about or that someone is suspected cheaters, they would actually have to go to a LAN tournament to play before they go to the next stage. And then you could potentially have a bigger offline qualifier, so you have a lot of teams that might have lost against those suspected cheaters, and they would already be at the qualifier. I think there is definitely some stuff to do, but also there is such a long road for going from the open qualifier to the closed to the Minor. I think it's a very very long road. I'm really a fan of how DOTA works. The way they have a circuit, also how League of Legends works where you earn a certain amount of points and depending on how good you do you will also be present at Worlds or The International. I think eventually that will be the system for CS:GO too, but there's a long ways to go. Straight after this tournament you're right back out again aren't you? You mean like going to other tournaments? Yeah I think we have like 7 or 8 days off then we go to Istanbul, so I mean we just keep going for tournaments all the time. We just had a player break, so there's only the tournaments looking forward, so we have no time off. Do you like that aspect, being able to constantly travel around and constantly play tournaments, or do you want a bit of a break? I think it's very important that you enjoy traveling and you enjoy spending time with your team and all that stuff, I think it's really nice to travel. I get to see the world and spend time with the people I like spending time with, and I think that's really important. I really do love it. Obviously there is a lot of travel, but it's very much up to yourself. If there's a tournament we don't want to participate in, we can just say we don't want to go, and then we just don't go. Then we can have our own little break, but I think we have found a really good way to not attend too many tournaments, but at least attends the ones that we want to and the ones we feel are important. So, on your way to the top 8, where you are now, was there any teams that surprised you by how they performed? I think NiP has been playing well to be honest, even though they didn't make it here. They actually somewhat deserve to be here. Obviously compLexity was not really any team we expected to be here, definitely not going through 3-0. We were the only team to beat them I think. I think they went 3-1 in the Qualifier, and then actually 3-0, so I think we were the only team to beat them. And we actually beat them without any struggle at all. Which I think is really weird. Liquid, obviously they have been playing well, but we know Liquid is a good team, so it's not really a surprise in that way. We lost to Liquid in the Group Stage, and I'm pretty confident we're going to beat them next time we play. I think they had prepared a lot for that best of one and they also approached the game in a different way than we expected, but I think we will be more prepared for them next time. I think that's the team I will mention. 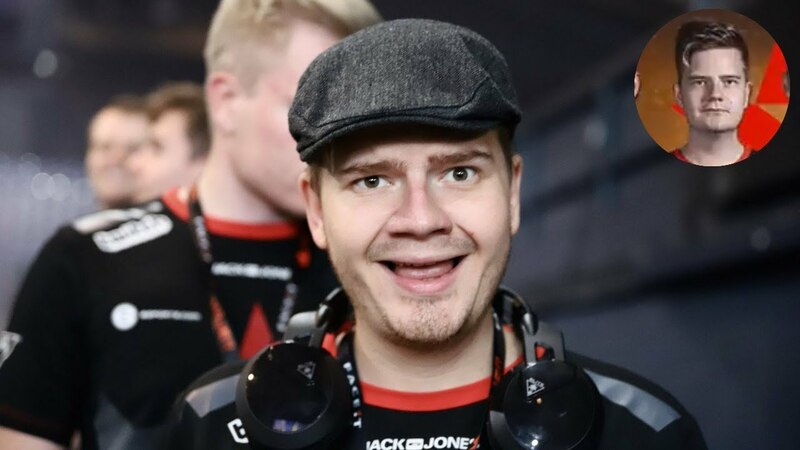 So obviously there was a change, Kjaerbye coming out , Magisk popping in. Initially after that change were you guys able to coordinate quite quickly? Yeah, it wasn't hard to get Magisk to fit in to the team at all. The best thing was that everyone got to a role they really liked to play. I went back to my entry fragging role, which I enjoy. I just want to be aggressive, and I got the chance to do so. Magisk picked up my old lurking role, and he plays on the other side of the map. Everyone just feels very comfortable playing with each other and the way we have built up this teamwork and the way we work together as a unit, even before games, the way we prepare for games, and the way we approach the upcoming games is really important. I think it's very unique. I'm very pleased to have got this kind of team. Talking about roles, you dabbled a bit in switching around roles. Do you see that experiment as a success or a failure? It's definitely a success for now obviously. We had our discussions whether dev1ce wanted to keep AWPing back in the day, and I had been playing as stand in with the AWP for him, and I felt like it worked out really well. I actually feel like I did a pretty good job, and then we jumped into the Major and everything just started collapsing because there's another kind of pressure. We were almost the previous Major champs, we didn't win in Krakow obviously, but there was some other pressure on. I got into an uncomfortable zone with the way I played the AWP, and the same for him, so we had two of our star players not playing the comfortable zone for the entire tournament. That was just really hard to approach. We decided to go back, because that's just the way it worked. Since Kjaerbye decided to leave, I decided to go back to my entry role, which I've always been doing, and I feel like it's the role that I strive with. So, just recently against MiBR, you guys had a really good result. I think it was the first 16-0 of the Majors. How does that weigh into your momentum? I think it's a really good place of showing that momentum is everything in Counter-strike. We had momentum from round 1, and we kept it till round 16. The thing is, the match was really confusing to play in some aspects, because I think they were starting to struggle a little bit, and they started to doubt themselves, they started to do random things that we didn't know about, and neither did they. So they were like, 'Let's go A, no let's go B.” and everybody just started to go like this and this. We just eventually got all the kills, because maybe we were in a lucky situation. I think there was definitely a few rounds we could have lost, where we just came down to our guys being in the right position, or getting a double frag where we weren't supposed to. Obviously it feels great to beat such a great team, and also to be the first team to win a 16-0 game. It was kind of unreal in a way having won 16-0, because we just beat the former SK team, and they were always one of the best teams in the world, so it was a bit unreal. But that's just what happens sometimes, and I'm happy about the result. Obviously with you guys on one side of the bracket, in a dream Grand Final, who's the opponent on the other side? Well, some would say it would be FaZe Clan, but we will face them in the quarters, and some would say it was Liquid, but we could potentially face them in the semis. I do think I have to pick NaVi coming from the other bracket. And I obviously think that NaVi is going to go to the Finals on that side of the bracket. I do think MiBR could potentially beat them, but then again I feel like NaVi was another edge to their game, and the way that MiBR might be approaching it, they still might need some time to figure out all this language thing, and figure out how they want to play, and bring in Janko the way they want. You can definitely feel they're starting to play a lot better, and give them two months and I think they will be a top 3 team in the world. But I would still give the edge to NaVi in this one. I think NaVi is going to go to the Grand Final, and then it depends on who shows up on the stage, if it's going to be us, FaZe Clan, or Liquid. So talking about Astralis as an organization, it seems as though they're on the forefront, trying everything, with the sports psychologist and everything, how much has the org helped you as a player? I mean there's so many aspects right now that it's hard to actually pinpoint out which one is most helpful. It's a mixture of everything, the way that we had a psychologist helping us, the way that we approach pressure and work with pressure. But also the way we approach the game and seeing it as a career instead of just seeing it as something we have on the side. The fact that we try to do everything together as a team. We don't go out super late, we go out together, we all eat breakfast and try to work out together. We eat lunch together and all that stuff. We always try to do everything as a team, and I think that's a very important aspect, and we also try to always, if there's a problem within the team, we try to loosen up. We try to talk about it, instead of making it just a big problem, we try to talk about it, and it usually solves itself and everyone is happy again. So I think we have a really good way to approach that. Thanks a lot man, and good luck in your game. Interview transcribed by James 'PalmtopPitbull' Wert.